What is the 4-H Western Heritage Project? The 4-H Western Heritage Project is a combination of 4-H Shooting Sports and a living history of the frontier west from﻿﻿﻿ 1860 to 1900. ​July 30 - August 1 - Winton, California!! Attention 4-H Western Heritage members and families! The 4-H Western Heritage Project combines a comprehensive study of the Old West with the fastest growing shooting sports discipline in the world – western action shooting. 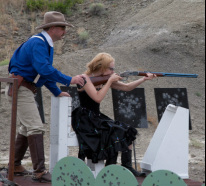 The purpose of this project is to provide an avenue for 4-H members and adult leaders to experience the lifestyles and cultures of the Old West from the period of around 1860- 1900 through a living history approach to learning while instilling the concepts of gun safety and personal responsibility. Members dress in Old West clothing, shoot replica firearms of the frontier period, and expand their knowledge of U.S. history. Each year culminates in a championship event where 4-H members shoot for the fastest time, take a history exam, and have their persona knowledge assessed. It's not always the fastest shooter who wins. This project is now active in Montana, Missouri, Oregon, Washington, Kansas, Colorado, California, Alabama, and Oklahoma with more states requesting training each year. "Being with other kids and practicing skills"
"Living the old west style"
4-H projects- it made it less work for me"
"The history and shooting combination"
"The end of the project year"
"I had no least favorite part"